This is what our Friday night picnics look like. The kids are off to the right on the playground. Caroline had a tea party with her babies and animals. Tucker tried desperately to be a part of the party but all he got was this cup. Tucker leads the way on our "adventure" Sunday morning. 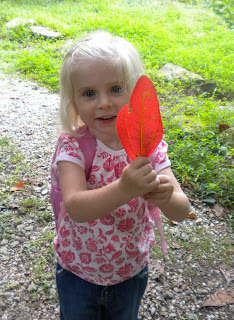 Caroline was very proud of her red leaf! We had a picnic in the gazebo on Abbo's Alley. Apparently this is what bears look like. Beautiful scenery on a beautiful day. 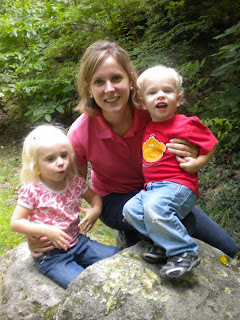 Mom and kiddos on a "big rock!" Caroline and Tucker were trying to see if their voices echoed in the cave. They said "echo" a million times! 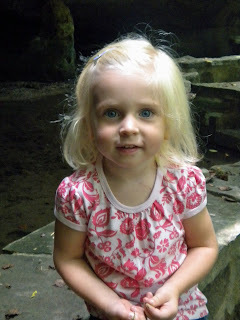 Ok, here's your picture...can we please go see the horses now?